Johan Santana pitching for the Mets. 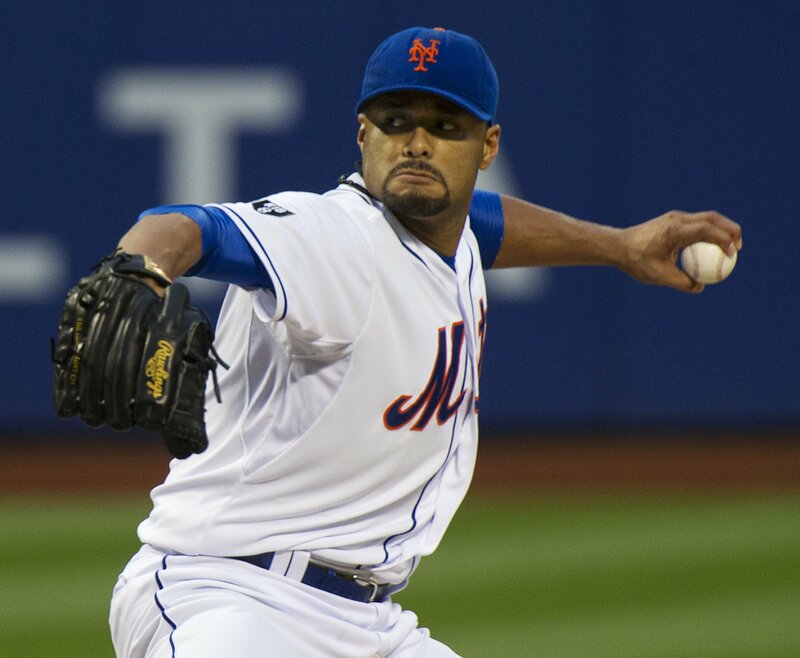 Johan Santana, who has not pitched in the majors since the 2012 season, is currently drawing interest from the Yankees. The Toronto Blue Jays, San Diego Padres and three other teams have also shown interest, according to John Heyman. He will be 36 in March, and he won the Cy Young in 2004 and 2006 while pitching for the Minnesota Twins. He is currently pitching in the Venezuelan Winter League. On Tuesday, he retired all six batters he faced on only 18 pitches. His next start during his comeback attempt will come on Thursday. He has only made 21 starts over the last four seasons due to two torn shoulder capsules and a torn Achilles tendon suffered last season during a comeback attempt with the Baltimore Orioles. Since throwing the first no-hitter in Mets history on June 1 of 2012, Santana has only pitched in 10 games. Many believe that game led to the injuries that he had in after the 2012 season because he threw 134 pitches to get that no-hitter. After pitching flawlessly that night, he allowed four runs or more in seven of his nine starts the rest of the season. The theory that over pitching him that night led to his downfall makes sense since he had a 3.24 ERA going into the no-hitter and finished the season with a 4.85 ERA. In his last healthy season, when he was 31 in 2010, he threw 199 innings over 29 starts, had an outstanding 2.98 ERA, had 144 strikeouts and only 44 walks with the Mets. Between 2004 and 2010 with the Twins, Santana was an All-Star four times, never had an ERA above 3.33 or a WHIP above 1.21. He recorded more than 200 strikeouts in 2004, 2005, 2006, 2007 and 2008, while being a top-five pitcher in the American League during those years. If he continues to dominate in the Venezuelan Winter league, while not getting injured again, it would make sense for the Yankees to bring him into spring training on a minor-league deal. If the Yankees don’t add a starter who pitched well in the majors last season, he would make sense to gamble on for the No. 5 spot in the rotation. He will need to be able to locate his pitches the way he did in the beginning of 2012, and if he can, he could help the rotation until Ivan Nova returns. When the Yankees brought in Bartolo Colon in 2011 as a 38-year-old he was coming off a year where he was out of baseball due to injury and many didn’t expect much from him. He ended the season with a 4.00 ERA over 26 starts, which is solid for a No. 5 starter. It can’t hurt the Yankees to sign Santana because he could end up being an asset in the rotation or they could cut him and not lose much. Here is Brandon McCarthy pitching for the Diamondbacks. 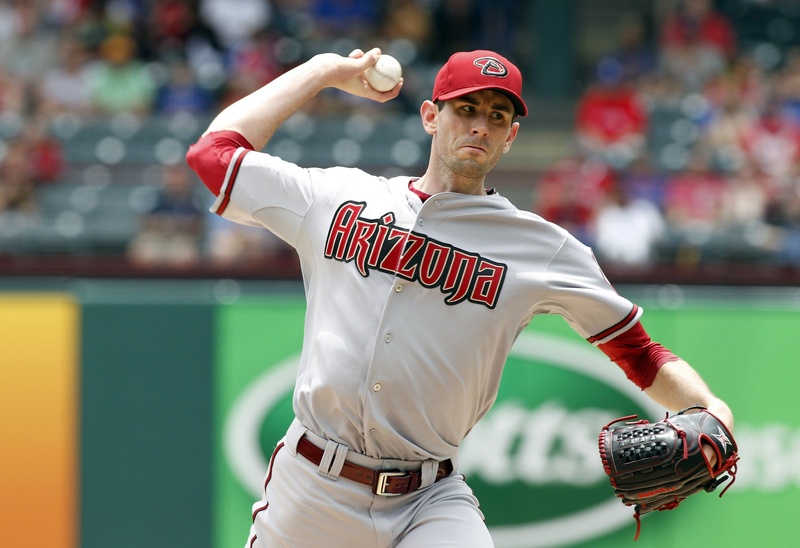 According to Ken Rosenthal, the Yankees have acquired Brandon McCarthy from the Arizona Diamondbacks in exchange for Vidal Nuno. Buster Olney said that McCarthy is owed about 4.8 million for the rest of the season, plus a $1 million assignment bonus. The Diamondbacks will pay more than $1 million of that. Arizona will be able to save money because Nuno makes much less than McCarthy. McCarthy and Nuno have both struggled this season, as they have a 5.01 ERA and 5.42 ERA, respectively, but McCarthy should definitely be an upgrade over Nuno. McCarthy has pitched better recently after allowing two runs in 5.2 innings in his previous start and one run in 7.0 innings in his start on June 27. One of the advantages of having McCarthy over Nuno will be that McCarthy will be able to give the team length in games that Nuno was not able to do. McCarthy has pitched 6 innings or more in 12 of his 18 starts, but Nuno his pitched 6 innings or more in only five of his 14 starts this season. Nuno, the rookie who was pitching in the Independent Frontier League before the Yankees signed him, allowed 12 runs combined between his starts on June 15 and June 21. McCarthy, who is in his ninth season, has previously pitched for the Chicago White Sox, Texas Rangers, Oakland Athletics and the Diamondbacks. He had by far his best two seasons from 2011-2012 while pitching for the Athletics. In 2011, he had a 3.32 ERA and a career-high 123 strikeouts. In 2012, his 3.24 ERA was the lowest of his career. The veteran righty from Glendale, California, who has a 4.21 ERA for his career should be a major improvement over Nuno. He will be able to help the Yankees in their quest to make the postseason after not qualifying in 2013 better than Nuno would have. The Yankees are currently 3 1/2 games behind the Baltimore Orioles for first place in the AL East and 4.5 games out of the second Wild Card. The Yankees needed to add a pitcher to improve their rotation, and they were able to do that without giving up one of their better prospects. They could still look to bring back former Yankees Bartolo Colon or Ian Kennedy, who would both be improvements over Chase Whitley. In other player news, the Yankees have designated Alfonso Soriano for assignment. He gave the team a lot of power after being acquired from the Cubs last July (17 homers in 58 games), but Soriano has only hit .221 in 2014. He also repeatedly did not come through with runners in scoring position. Soriano will likely have a team gamble on him finding his swing, but the Yankees could not wait any longer for him, especially since they have been struggling to score. 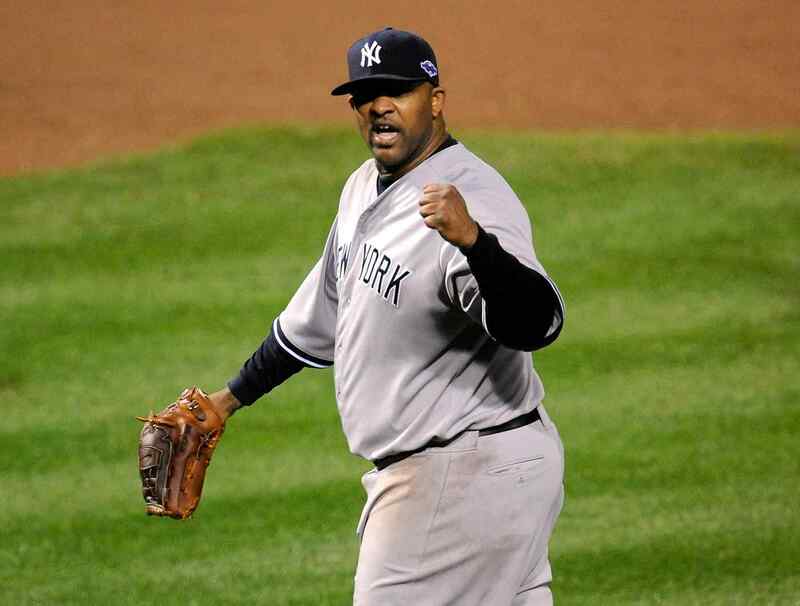 CC Sabathia pitching for the Yankees. He lost a lot of weight during this offseason. Spring training stats are usually not worth paying attention to, but for CC Sabathia, who was the ace in his first four seasons with the team, the three runs that he allowed in three innings against the Washington Nationals in Viera, Florida on Tuesday is alarming. Sabathia, who had a 3.38 ERA or less and an average of 18.5 wins in his first four seasons with the Yankees, is coming off a season where he regressed with a 4.78 ERA, a 14-13 record and a very high 1.37 WHIP. So far in the spring, the 33-year-old Sabathia has pitched a total of five innings across two appearances, and has allowed three earned runs, six hits and two walks. All of those runs came in his start on Tuesday. This spring training is important for him because he needs to prove that he can locate his pitches better than last season. He needs to prove to himself that he can pitch effectively with his decreased velocity because it does not seem like his mid-90s fastball that he had earlier in his career will be coming back. The Yankees radar gun clocked Sabathia’s fastball between 88-89 MPH. “His command was a little off today; that’s really where he got in trouble,” Joe Girardi said. The damage would not have been as bad if he didn’t allow a two-run double to Anthony Rendon on a pitch that he threw higher than he wanted, but he pitched well according to catcher Brian McCann. His decreased velocity proves that he needs to make an adjustment as a pitcher. Carsten Charles has impressive career stats that are Hall of Fame worthy excluding his performance during 2013. Sabathia finished second in Rookie of the Year voting in 2001, is a six-time All Star, won the American League Cy Young award in 2007 with the Cleveland Indians after winning 19 games and finishing with a dominating 3.21 ERA and recorded a career-high 230 strikeouts for the Yankees in 2011. His best season with the Yankees was in 2011, only three seasons ago, where he had a 3.00 ERA, the aforementioned 230 strikeouts and a great 3.77 strikeout to walk ratio and 237.1 innings. He has always been a workhorse, he just needs to reinvent himself now that he can’t rely on his fastball to go along with his other plus pitches. Since his fastball isn’t nearly as fast as it used to be, he needs to locate it exactly where he wants it to go, in order to prevent extra base hits. One pitcher he could try to emulate is none other than the soon to be 41-year-old starter for the Mets, Bartolo Colon. The hefty righty is in his first year in Queens after pitching arguably his best season of his career during his second season pitching for the Oakland Athletics. Colon, in his year 40 season, won 18 games, had a 2.65 ERA, which was much lower than his Cy-Young campaign of 2005, and only walked 29 batters. Colon pitched for the Yankees during the 2011 season and had a solid bounce-back after being out of baseball for a year. He was able to pitch his first 150 + innings season since 2005, and had an improved 4.00 ERA, 135 strikeouts and used his pin point fastball accuracy to get outs. He has been able to improve every season since 2011. Earlier in his career, Colon was able to bring the heat as he was able to throw about 100 MPH, but last season, according to Tyler Kepner, his fastball averaged 89.9 MPH. He has so much movement on his fastball and he throws it in every part of the strike zone that the fastball can serve as more than one kind of pitch. Colon threw his fastball in 85.5 percent of his pitches he threw last season with Oakland, while Sabathia often uses his plus changeup or slider as an out pitch. Sabathia’s cutter, which he has recently added to his arsenal, could help offset his decreased velocity. However, he needs to be able to locate his fastball exactly where he wants it to go like Colon so that he can get ahead in the count, to lead to throwing his changeup. The Yankees will need Sabathia to rebound and have stats more like he did in 2012 than 2013 if they are going to live up to expectations. The addition of Masahiro Tanaka will be an upgrade for the rotation, but Sabathia can’t be a weakness like he was last season. Based on other pitches who have lost velocity later in their career and succeeded, it seems like Sabathia should be able to continue to be a productive pitcher. The return of Big Bart??? The heft righty tosses the ball to himself during a start. It was recently reported, by Wallace Mathews, that everybody’s favorite reclamation project, Bartolo Colon, has a good chance at wearing pinstripes again during the 2012 campaign. Nobody could have realistically predicted that Colon, who had not successfully been able to stay healthy and pitch the whole season since 2005, would be able to have the stats that he produced this season, especially in the first half. It might have been partly due to his stem cell procedure, but he proved the type of pitcher that he is capable of being when not sidelined by injury. However, as a result of his production during the 2011 season he will be asking for a pay raise, as a reported by Mathews. I am not really in favor of this because I am not sure the Yankees can count on him replicating last season or even improving. If Colon is able to give the Yankees close to the same 4.00 ERA, 135 strikeouts, 40 walks, 26 starts and 164.1 innings that he gave them in 2011 then he would be worth bringing back, but I don’t think they can count on these stats again. He was an amazing, under the radar, cheap signing by General Manager, Brian Cashman, before Spring Training, but at his advanced age (38) he is not worth bringing back at anything more than 1 million. The 2011 campaign was the first one that he made more than 18 starts since his dominating CY Young season, in 2005, where he made 33 starts, had 21 wins, pitched 222.2 innings, had 157 strikeouts and had a 1.15 WHIP for the Angels. Cashman should reward him with a very small raise (over his $900,000 from 2011) but not give into overspending for a pitcher that will be 39 in May and could breakdown at any moment. Since the 2005 season, Colon has had numerous injuries that caused him to miss time including inflammation in his right shoulder, a hamstring injury, injured ligaments in his throwing elbow and shoulder and in 2009 he suffered an undisclosed injury after his 12th start. His 265 pound frame surely does not help him prevent injury. In all regards, Colon had a successful campaign in 2011, was an instrumental piece of the Yankees’ success, deserves to be a starter or long reliever in 2012, but because of the above reasons he is not a pitcher worth gambling on. However, if they can sign him for 1 million as a long reliever/fifth starter I would do that. The Yankees begin their final series of the season, against the Tampa Bay Rays, with nothing to play for as they wrapped up home-field until the World Series during the 9-1 thrashing of the Red Sox on Saturday. However, a major benefit of having no incentive for winning these final three games is that they will be able to rest regulars while giving the Rays a golden opportunity at winning the Wild Card over the Red Sox. The Red Sox will be playing the Orioles for their final three games, and even though Baltimore is in last place they have a great chance at continuing to play spoiler since they swept the Red Sox last week during their impressive month of September. The Red Sox currently hold a one-game lead over the Rays and Hector Noesi, who has mainly pitched out of the bullpen, will be pitching tonight for the Yankees in Tropicana Field. The Yankees obviously want Noesi to pitch well but if he allows four or five runs it will not be the end of the world. All that matters in these last three games is that nobody gets injured before the playoffs commence. The Catch-22 in this scenario is that the Rays could potentially be the more difficult team for the Yankees in the American League Championship Series because of their vastly superior starting pitching, but the Yankees would like nothing more than having the Red Sox miss the playoffs as a result having an even worse September record than the worst team of all-time, the 1962 Mets. Bartolo Colon will pitch the second game of the series against rookie Jeremy Hellickson. After Tampa sent out James Shields in the first game, who has a 2.87 ERA, the Yankees will have another challenge in game two when facing Hellickson, who comes in with 13 wins and a stellar 2.90 ERA. During the month of September, Colon (4.02 ERA, 132 strikeouts) has pitched himself out of consideration for a spot in the playoff rotation, for the first round, since he has allowed four runs or more in three out of his last four starts. However, even though he only has an outside chance of being the fourth starter in the ALCS, he still deserves the Comeback Player of the Year, after not pitching in baseball last season, and having his first solid campaign since 2005. The rotation that would give the Yankees the best chance of winning in the first round, against either the Tigers or Rangers, would be CC Sebathia, Ivan Nova and then Freddy Garcia. 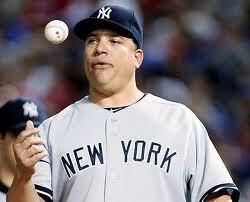 However, it is hard to figure out why Joe Girardi and Brian Cashman are even considering A.J. Burnett for a playoff start. Even though he had one of his better starts of his season, allowing two runs in 7.2 innings in the 6-2 win on Sunday, he is too inconsistent to be relied upon in the playoffs. Mariano Rivera, who is the best closer of all-time, recently received another accolade, after being named the Player of the Week. He has made at least 60 appearances for the 14th time in his career and has recorded his 8th career 40 save season. He set the all-time saves record with his 602nd last week, while coming off of a two week span where he has picked up five saves, pitched six innings and only allowed three hits. He will be a valuable asset in the postseason, as he is probably the best playoff pitcher of all-time, sporting a miniscule ERA of 0.71 during his 15 seasons appearing in the postseason. I was luckily able to attend the Yankees game on Thursday night against the Tampa Bay Rays, thanks to Kieran, enjoying it very much, even though they lost 15-8 in a game that the Bronx Bombers rested many regulars. When we settled into our seats it was obvious that the Yankees had clinched the division crown the night before. The crowd was not quite as loud as normal during player introductions and it seemed like the Bleachers’ roll call was not as emphatic as usual. However, I always get a kick out of hearing the Bleacher Creatures shout the fielder’s names and watching each individual Yankee respond in their own unique way. It seems like when all the starters are playing both sides are more into it but this was probably only about 10 percent less than normal. The major benefit of this game is that as a result of the 15-8 thrashing to the Rays, Tampa improves by half a game in the Wild Card race as a result of Boston not playing. In other words, the Yankees impressive wins the previous three games against Tampa helped Boston not nosedive out of the Wild Card. Nothing was working for Bartolo Colon as he allowed seven runs, but only five of them were earned as a result of two errors in the first two innings, on seven hits and a walk in only three innings pitched. This lackluster performance by Colon, which raised his ERA from 3.81 to 4.02, might be a result of the long celebration after the win on Wednesday and knowing that the team had the division locked up. The Yankees need to be able to put this game behind them as they play the Red Sox for three games in an effort to knock them out of the playoffs and wrap up home-field advantage. Nick Swisher failing to field a routine ball hit to him on the ground in left-field and Derek Jeter telegraphing his throw to first as he almost threw it into the stands surely did not help. Jeter almost always makes the routine play, which proves that this game was purely a letdown game for the team. In addition to this error by Jeter he would make another one later on, but I would miss it since I was on line for some “gourmet” Carl’s cheese-steak, but this one was almost even more unexpected than the first. In the fourth inning, the Rays former All-Star third baseman Evan Longoria hit a grounder that Jeter would field cleanly 99 out of 100 times but this time he let it go right through his glove allowing Longoria to score on Johnny Damon’s homer two batters later. The Yankees fourth error was committed by back-up outfielder Chris Dickerson, in the seventh, with the home team losing 13-2. The highlight from my perspective from the first six innings of play was without a doubt the two run homer by Andruw Jones to deep left center (12), in the bottom of the sixth. This is because it was the first time the fans had a reason to get loud and cheer for something positive. Dickerson would also somewhat cancel out his error by making a beautiful running catch and he even dove at the end for style points. With the game all but in the books, the Yankees were able to tack on some garbage time runs, to use a football phrase, and keep the remaining crowd interested. We moved down at this point as I had the idea of exploring the 100 level section, which I had never really done before, and also looking for two people. Rookie sensation Jesus Montero was able to have a perfect night at the plate, truly looking composed and ready to attack the baseball. He went 3-3 while hitting a double to deep center scoring Ramiro Pena and Jones, in the seventh. Pena, who is a reliable fielder but usually a weak hitter, chipped in with a shallow RBI single followed by a single by Jones that scored rookie Austin Romine, which capped of Jones’s productive day at the plate. This would add up to four runs making the score Tampa 13, New York 6, which was a little more respectable. Each team would add two more runs but they were more because of sloppiness by the pitchers and fielders and not any noteworthy offensive execution. Matt Moore, the starter for the Rays, was expected to feel some butterflies as he was making only his fourth appearance of his career, while making his first start in the Bronx. However, he did not let the big city get to him as he looked poised on the mound hurling five shutout innings, while striking out 11. The two players that got the loudest ovations from the fans were Jorge Posada and the previously mentioned Montero. This is because Posada hit the two RBI double on Wednesday night that was the difference in the Yankees division clinching win and he has always been a fan favorite since 1998. Montero received loud ovations when coming to the plate because Yankees fans have been looking forward to his promotion as a result of his vast offensive potential and once he was called up on September 1st he has given the team a spark. He has an impressive .313 average so far with three homers and eight runs batted in and the only knock against him is that his catching skills could use a little improvement. In addition to seeing a home run, something else that I was hoping to see came to fruition and that was the much publicized rookie hurlers,Andrew Brackman and Dellin Betances, making their debuts. These are two of the three “Killer B’s” as the three pitching prospects for the Yankees with the most potential are Manny Banuelos, Betances and Brackman. The 26 year-old Brackman, who has had some serious injuries, is a mammoth 6’10 and played basketball and baseball in college at North Carolina State University. His late start in the majors is due in part to attending college for three years as well as undergoing Tommy John surgery. There were six Yankees pitchers and he was one of only two to keep the Rays off of the scoreboard. It was a highlight seeing Betances make his first appearance of his career even though he allowed two runs on four walks, while only recording two outs. He was probably feeling a lot of nerves because he was pitching in front of friends and family since he grew up in Washington Heights and has lived in the Lower East Side as well as Brooklyn. I remember Betances, who went to the Grand Street Campus high school, in Bushwick, Brooklyn, likely being the best pitcher in the city when he was a senior. To be able to make his debut in the Bronx must have been a very special feeling for him even though he was very wild. I was even able to find some Rays fans who flew up just for the day to watch this game and then will be flying back to Florida on Friday morning. They surely enjoyed their introduction to Yankees Stadium and being able to move half a game closer to Boston. It is likely that the reason the Yankees did not show up to play was because of the long champagne celebration the previous night but it was great to see some of the rookies like Montero, Brackman and Betances in person. 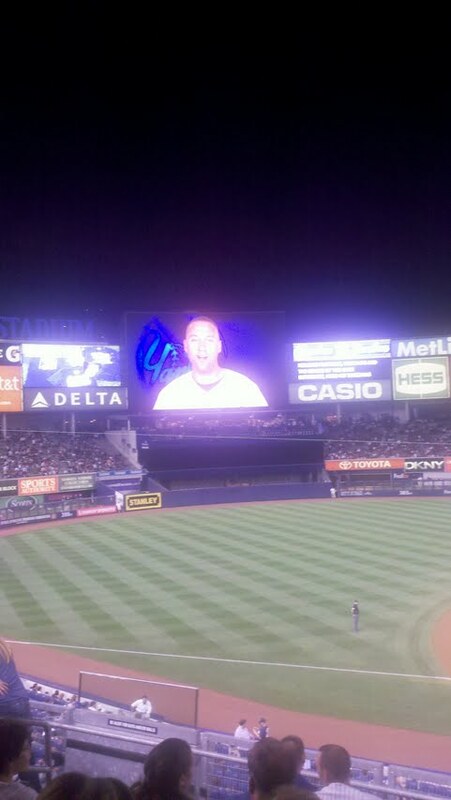 It was also a thrill to see the homer by Jones because that prevented the Yankees from getting shutout. The Yankees had a chance to push their lead in the American League East to 5 games, with 10 games remaining, but Brandon Morrow pitched eight dominating innings for the Blue Jays in their 3-0 victory. This loss, in a game where Freddy Garcia was only able to pitch 4.2 innings, closed out their three city road trip where they only went 4-5. Luckily, the Red Sox are 2-8 in their last 10 games so the Yankees did not lose ground in the standings. The Red Sox now only have a two game lead in the Wild Card over the Rays after losing three out of four in the series that ended on Sunday. Morrow only gave up four hits in his eight innings and has owned the Yankees offense this season pitching to a 1.74 ERA in three starts. However, the Bronx Bombers did not exactly send out the A lineup as Eric Chavez replaced Mark Teixiera at first, Ramiro Pena was the shortstop giving Derek Jeter the day off and Chris Dickerson got a rare start as Curtis Granderson didn’t play as a result of having a very low career average against Morrow. All-Star second-baseman Robinson Cano got half the game off, as he was the Designated Hitter and Eduardo Nunez got the start at second base. Nunez was the only player who really showed up on offense as he improved his average from .254 to .261 with his three hits. Another troubling sign about this game, in addition to the offensive ineptitude, was that Garcia had his third consecutive subpar start. He only gave up three runs, but Girardi took him out at the right time since he gave up five hits and three walks including two solo home runs to Adam Lind. In his two previous starts Garcia had allowed five and seven runs, respectively. Hopefully this is not a sign of what is to come as he will be needed to be relied upon as the fourth starter in the playoffs. The Yankees bullpen continued to be a bright spot as they were lead by Luis Ayala who pitched 1.1 perfect innings, and Raul Valdes who pitched 1.1 innings, only allowing one hit in his first appearance for the team. The imminent Comeback Player of the Year, Bartolo Colon, who was the other pre Spring Training signing to a cheap contract, also struggled mightily in his last start, on Saturday, against the Blue Jays. However, this was not totally unexpected as he has a 7.99 ERA and a .327 BAA in five starts against Toronto this season. He should be the Yankees number three starter in the playoffs. If Manager Joe Girardi would have trotted out all of his regulars they could have had a 5.5 game lead over the Red Sox heading into their makeup game against the Twins, in the Bronx, on Monday afternoon. It is impossible to win when you don’t put any runs on the board and having all the normal starters playing would have surely helped the offensive attack. However, this was the last chance for Girardi to give some of his injured players a day off as the rest of their games down the stretch are all critical. It is almost guaranteed that the Yankees will win the division, since they are up by 4.5 games with 10 games left but it is important to go into the playoffs with momentum. In today’s matinee tilt against the Twins A.J. Burnett will be pitching who comes into the contest with a 5.20 ERA and 10 wins. He is lucky to have that many wins as Colon has eight wins but a very respectable 3.81 ERA. This should be Burnett’s last start of the season as he has mysteriously received a few extra starts since Girardi decided to stick with the six man rotation. The Twins rookie, Scott Diamond, who is from Ontario, Canada, will be pitching for the Twins. Diamond went to SUNY Binghamton, in upstate New York, which is not known for producing professional baseball players. He has made only five starts after coming up from AAA Rochester and has one win with a 3.94 ERA. Minnesota is the worst team in the American League so the Yankees need to win this game before the Tampa Bay Rays invade the Bronx for three games. The Yankees are in as strange position during the series with Tampa since sweeping the series will drastically help the Red Sox win the Wild Card. Also, on Saturday, Granderson became the only Yankee besides Joe DiMaggio, Lou Gehrig and Babe Ruth to have had seasons of at least 20 doubles, 10 triples and 40 homers. He has joined exclusive company as those are three of the best players of all time.